Provide comfort for the family of Nancy Penniman with a meaningful gesture of sympathy. 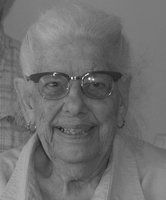 Nancy Penniman, 94, of Friendship, Maine, passed away peacefully in her sleep on March 30, 2019, at the Knox Center for Long Term Care in Rockland. Nancy’s smile and warm and caring personality lit up the world of those who were fortunate enough to know her. Nancy was born on December 27, 1924, in Brooklyn, New York, to Jean and Alfred Boudreau. She spent her childhood in Somerville, Massachusetts, and later worked at Kemper Insurance in Boston, Massachusetts, where she met her husband Arthur L. Penniman. They were married on June 24, 1950, in Brookline, Massachusetts, and lived for several years on Beacon Hill in Boston before moving to Friendship, Maine in 1956 to raise their growing family. On their farm they had sheep, goats, rabbits, ducks, geese, chickens, guinea hens and bantam chickens. Nancy was very active in the Friendship community. She was a librarian at the Friendship Public Library, which as an avid reader was an appropriate job for her. She supported the Friendship Sloop Society, serving as an assistant secretary and helping on Sloop Days. Nancy was the Friendship Day parade Grand Marshall in 2015. She was an excellent cook. Nancy was well known for her wedding cakes and cinnamon rolls and for her dinner rolls which she baked for many community dinners. She made beautiful braided rugs, which she donated to many community fund raisers. Nancy enjoyed gardening, and was especially fond of gladiolus and lupines. Her lovely lupines cascading down the front of her former property continue to bring a smile to all those who drive by. She is predeceased by her beloved husband of 48 years, Arthur L. Penniman. She is survived by her son Clayton Penniman and his wife Chris of Old Lyme, Connecticut, and by daughter Melinda Carlson and her husband David of Gorham, New Hampshire, as well as two grandchildren, Eric Penniman and Ben Carlson. She is also survived by her sister Fay Bragan and her husband Bob, and their children Edward Bragan and Jean Bragan, and her step-granddaughters, Suzanne MacLeod and Stephanie MacLeod. Her warm smile and kind and generous heart will be missed by family and friends. A small graveside gathering will take place later in the spring. Donations in her memory may be made to the Resident Activity Fund, Knox Center, 6 White Street, Rockland, Maine 04841. Provide comfort for the family of Nancy Jean Penniman by sending flowers.